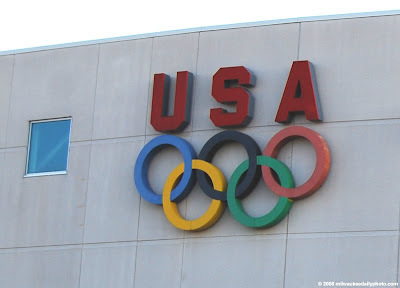 These Olympic Rings are on the Pettit National Ice Center in West Allis. As an official Olympic Training Facility, the Pettit hosts speedskaters in training for international competition. The building houses two Olympic-sized hockey rinks and a 400-meter speedskating oval. The Pettit hosts local, regional, and national competitions in both Short Track and long distance speed skating, and is home to local hockey and figure skating groups. Because the 2010 Olympics are in Vancouver, the Pettit will serve as a primary training site for our speedskating team, as both locations are close to sea level.